By Charles Mkula, a journalist who has worked for a number of newspapers and magazines in Malawi since 1998. As the sun rises, Norah Baziwell leaves her family home here in the crowded squatter settlement of Mtandire Township. Pushing a wheelbarrow containing a shovel, rake, pick, hoe, watering can, pail, gumboots and gloves, she heads about a hundred yards down a dirt road to check on her treasure stashed under plastic wraps. That treasure is a mound of compost, or manure as it’s called here. Baziwell made the nutrient-rich soil from trash she collected in Mtandire, about 80 percent of which consists of biodegradable organic material. She sells the finished product to a local nursery, earning about $50 U. S. in a typical month — income that helped Baziwell and her husband expand their old house, build a modern new home and send one of their seven children to university. 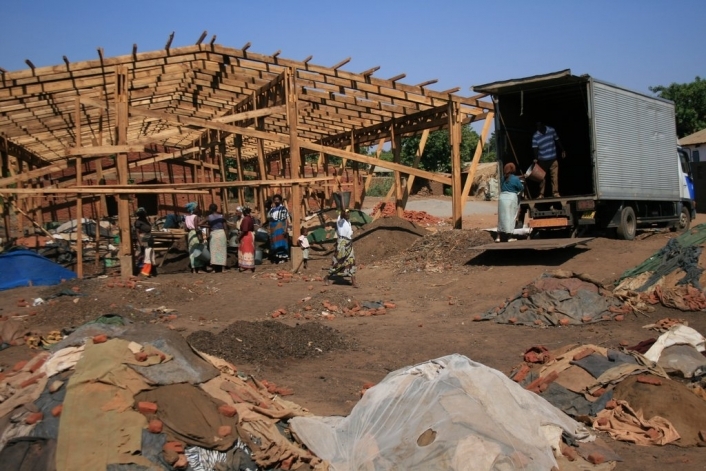 Baziwell is one of the pioneers of a movement started several years ago to improve the urban environment in this unplanned settlement on the edge of Malawi’s capital. Lilongwe city authorities have long neglected waste collection in poor areas like this. Garbage piled up on street corners, in open spaces and along roads, creating a terrible stench and spreading diseases such as cholera. Mtandire’s approach to waste could hold lessons for other cities as Africa continues an epic wave of urbanization. According to the African Development Bank, the urban share of Africa’s population has grown from 19 percent to 39 percent over the past 50 years, and it’s headed to 58 percent by 2030. Landlocked Malawi is urbanizing at twice the rate of the rest of the continent. Lilongwe, a city of 700,000 people, generates more than 350 tons of solid waste a day — about half a kilogram (or one pound) per person. The Lilongwe City Council is responsible for waste collection, but has been unable to keep up with the rapid growth in squatter settlements. According to Mtafu Zeleza Manda, a planning expert and consultant here, waste management in Malawi is a relatively new phenomenon. In 2008, the Lilongwe City Council teamed up with local NGOs and university researchers to figure out a different way to handle solid waste in fast-growing impoverished areas. They set up a pilot program in Mtandire and another community known as Area 25. They called the program “Waste for Wealth.” Promoting empowerment of women was a big component. With a $290,000 grant from the UN Development Programme, dozens of women were trained in composting methods, as well as leadership skills, hygiene and sanitation, gender equality and prevention of HIV/AIDS. The women were supplied with tools as well as some land and a shed for sorting and composting waste. A key partner is the Four Seasons Nursery, an upmarket florist and landscaper in Lilongwe, which signed on to purchase the compost. Not everything has gone smoothly. According to an evaluation by UNDP and UN-Habitat, land disputes in Area 25 made it difficult to find a place to make the compost, causing some women to drop out of the program. And many of the women complained that having only one buyer of the compost meant they had to accept low prices. 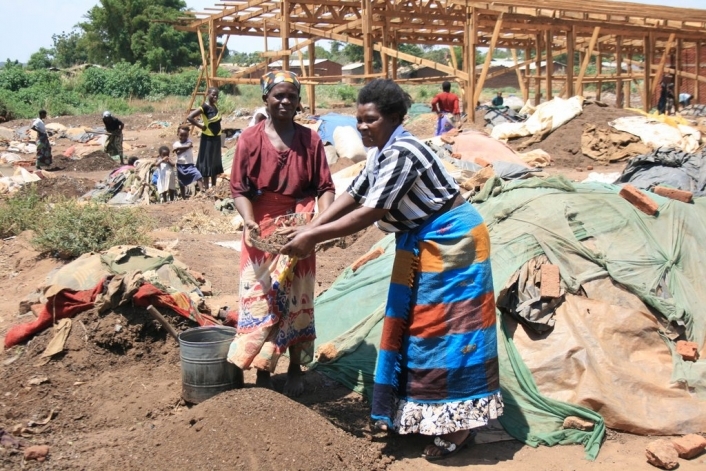 In a survey, most of the women from Area 25 involved in the project said it had not achieved the objective of creating livelihoods from manure production. Women from Mtandire had a much more favorable view. Two-thirds of those surveyed said the program had succeeded in creating a livelihood for them. What’s more, many said they had used their composting income to acquire land, improve their homes or send their children to school. A key to sustaining and scaling up this waste-management model will be finding more markets for the compost. The Four Seasons nursery has been a reliable buyer but it’s not big enough to consume all the compost Lilongwe is capable of producing. “These people indeed need more outlets and a larger market to improve on their bargaining power when they sell the manure,” says Mayor Bandawe. The compost entrepreneurs are trying to make inroads with other landscapers, recreational gardeners and florists.